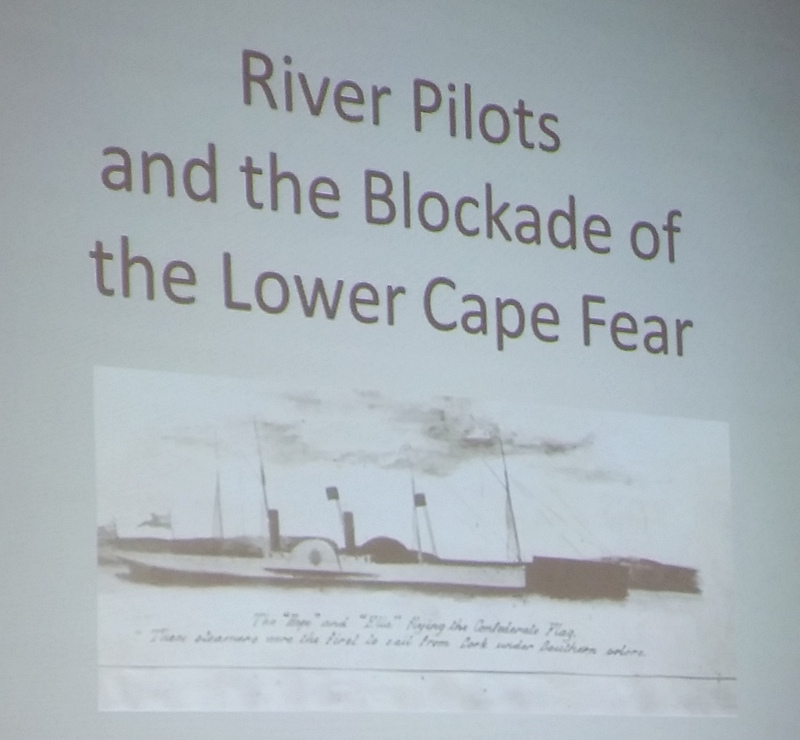 Brooks Newton Preik spoke on River Pilots of the Cape Fear River at the monthly open meeting of the History Center on Monday, November 16, 2015. Two of Brooks’ great-grandfathers were river pilots, one operating out of Southport and one out of Federal Point. By the time Brooks was born, though, the family seafaring bent was gone. 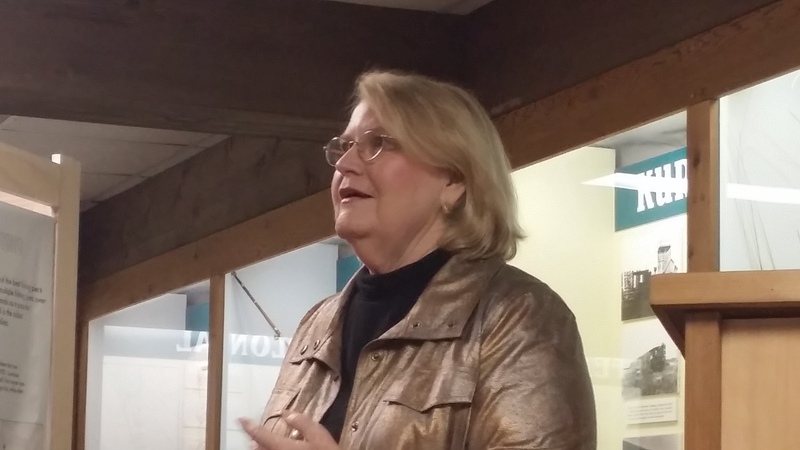 Her father was an accountant, and his closest encounter with the sea was walking along the water in Charleston to get to his office at the end of the dock. Then Brooks heard a ghost story that piqued her interest in her great-grandfathers and the other river pilots. It was “a dark and stormy night” when the little open dory went out to sea, and Mary Stuart kept the fire going all night in Southport, hoping her son would soon be home safe. Finally she heard footsteps coming up the front walk and she saw her son walk in, soaking wet. He walked to the fireplace and she heard the sizzle as he spit his tobacco wad into the fire. She walked over to hug him. But as she reached out her arms to him, he vanished into thin air. She knew then that the ship had gone down and her son, Thomas Bensel, was dead. Thomas Bensel was Brooks’ great-grandfather. What would possess a man to take a small boat with four men out on a stormy night in hopes of catching the job of river pilot? It was dangerous: the only way to get from the small craft into the larger vessel was by climbing a tall, swinging ladder up to the ship’s deck. And on a dark and stormy night… Why would anyone do that? Money. River pilots were paid very well—$200 a trip to guide a ship up the treacherous Cape Fear River to Wilmington, which had the rail lines Southport lacked to transport goods inland. The rule of the sea was this: the first river pilot to board a ship got the job. 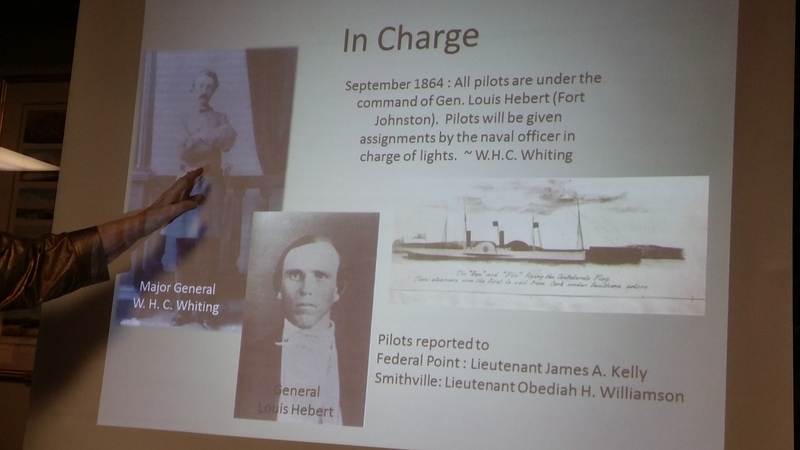 In 1860, there were 24 active pilots in Southport with its population of 700. Competition was stiff and river pilots would go far out to sea in search of a ship to pilot up the Cape Fear River. During the Civil War, river pilots became the last lifeline of the Confederacy, serving as blockade runners and carrying needed supplies. These pilots influenced the design of new ships, since the blockade runners needed to be fast, low in the water, and impenetrable to outrun the Union navy. The blockade runners carried cotton to Nassau and returned with arms and guns, and were often paid as much as $5000 for a run. The success of these blockade runners to bring supplies enabled the Confederacy to hold their ground and thus prolong the course of the war. The wind and the sea sing their requiem and shall forevermore.